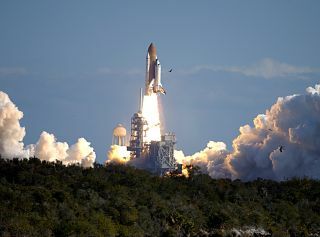 Space shuttle Columbia launches on mission STS-107, January 16, 2003. CAPE CANAVERAL, Fla. — Nearly seven months after Columbia broke apart over Texas skies the formal investigation is complete and the Columbia Accident Investigation Board (CAIB) report was released today in Washington. Here is a summary of some of the major events that have happened during the past weeks. For details on each of these developments, see the SPACE.com archive of Columbia stories. Feb. 1 Columbia lost over the Western United States. Feb. 2: NASA Administrator Sean O'Keefe appoints retired U.S. Navy Adm. Harold Gehman Jr. to head up Columbia Accident Investigation Board. Gehman lead the Navy's inquiry into the bombing of the USS Cole in Yemen in 2000. Feb. 3: NASA space shuttle program manager Ron Dittemore tells reporters at JSC that foam shed by Columbia's external tank was the likely "root cause" of the accident. Feb. 4: Gehman and original CAIB members tour Columbia's debris field as President Bush attends memorial service in Houston. Feb. 6: Reversing his initial assessment, Dittemore tells reporters: "It doesn't make sense to us a piece of debris would be the root cause of the loss of Columbia and its crew." Feb. 6: Bowing to pressure from Congressional Democrats led by Rep. Bart Gordon (D-Tenn.), O'Keefe announces his intent to revise the CAIB charter to add additional outside voices. Feb. 8: NASA confirms that it is assessing radar imagery obtained by the Department of Defense that shows an object coming off the Columbia during its second day on orbit. Feb: 10: NASA officials confirm for the first time reports that shuttle program personnel had reason to fear something was amiss during Columbia's 16-day mission. By the end of February, NASA will have released dozens of e-mails written by NASA engineers during the mission expressing concerns about the amount of damage potentially inflicted by the foam strike. Feb. 11: Congress calls the first hearing into the loss of Columbia. During the joint House-Senate sessions, O'Keefe is grilled on the status of the investigation and the spate of e-mails that, in hindsight, appear to be prescient warnings of disaster. Feb. 20: The U.S. Congress provides a $50 million down payment for the Columbia investigation in an omnibus spending bill for 2003. Feb. 25: NASA releases recovered cockpit camcorder videotape showing the crew during re-entry. Tape ends a few minutes before the first indication of trouble. March 5: Responding to pressure from Congress, CAIB asks O'Keefe to appoint three new board members: Nobel laureate in physics Douglas Osheroff, former astronaut Sally Ride, and George Washington University's Space Policy Institute Director John Logsdon. March 19: Columbia's data recorder is found near Hemphill, Tex. It is in good shape. A major breakthrough for investigators. April 17: CAIB releases first two preliminary recommendations — develop comprehensive inspection regime for RCCs and forge agreement with NRO to make imagery collection of shuttles on orbit a matter of routine. May 6: CAIB releases a second by second timeline of Columbia's disastrous reentry. May 9: NASA announces that Bill Parsons will replace Ron Dittemore as shuttle program manager. Dittemore said his plans to leave NASA were known before the accident. May 23: Study requested by CAIB shows a rescue mission was technically possible but extremely improbable. June 6: Ground tests begin to substantiate foam theory when RCC test article is damaged shattered at Southwest Research Institute. June 27: CAIB releases third preliminary recommendation — develop on orbit tile inspection and repair capability. July 1: CAIB issues fourth preliminary recommendation — treat shuttle as experimental vehicle and collect as much imagery as possible of liftoff and ascent. July 7: Foam impact test in Texas punches a hole in the RCC panel, prompting board member Scott Hubbard to say they had the "smoking gun" evidence of the root cause of Columbia tragedy. July 30: CAIB issues fifth preliminary recommendation — equip shuttles with onboard imaging capability. Aug. 26: Final report released.